A few weeks ago my colleague Colin Fanning (who coauthored this post with me) forwarded me a call for papers for an edited scholarly volume on Minecraft, the beloved and near-ubiquitous sandbox game by Mojang. Initiated by Nate Garrelts, Associate Professor of English in the Department of Languages and Literature at Ferris State University, the forthcoming book will explore the broader social and cultural impact of the game and its design. Various episodes in the history of construction play, and their contribution to a kind of background radiation that enabled Minecraft’s overwhelmingly positive reception. How Minecraft taps into specific ideas about toy design and psychological development, which contributed to the acceptance of the game’s value and use in educational settings. Diversity in the community of players and the ways in which Minecraft’s many-to-many culture resists the usual categorizations applied to physical toys. The rhetoric surrounding Minecraft and how it highlights contemporary understandings of the game’s connections to analog precedents (and how they stack up against historical examination). 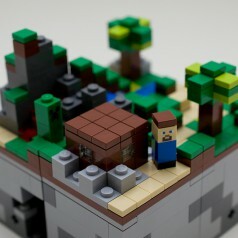 We’re certainly not alone in our thinking that Minecraft has some affinity with the physical toys that came before it. Note how it’s nearly impossible to talk about the game without someone eventually making an allusion to LEGO bricks, everyone’s favorite modular building block. In “Minecraft: The Story of Mojang,” the excellent 2012 documentary by 2 Player Productions, game designer Peter Molyneux dwells on this comparison in some depth, suggesting that Minecraft is filled with the creative potential that LEGO once had. While Molyneux’s point is helpful in understanding how designers and contemporaries view the importance of Minecraft and reasons for its popularity, his argument sets up a bit of a strawman re: LEGO toys and that company’s efforts. In our essay, we’re hoping to complicate the notion of Minecraft’s exceptionality (while still recognizing its uniqueness; don’t worry, we love punching trees, too!) by digging into the history of the larger ideas underpinning the game. Since beginning our research on this topic, Colin and I have noticed that one of the most integral and unique parts of Minecraft’s success is the willingness of players to collaborate and share. In the spirit of this transparency and openness, we are sharing our ideas here in hopes of fostering a larger generative dialogue. We’d love this project to receive many proposals and encourage you to read the CFP (listed on H-Net here) and share it with your colleagues—the deadline is October 1st, so there’s still time left to submit! We also want to ask you, our readers, to share your personal thoughts and/or associations on the similarities and differences between Minecraft and physical construction toys (e.g. LEGO, obviously, but what about Lincoln Logs? K’nex? Anyone? Bueller?). Additionally, are there any crucial points you feel need to or should be made about Minecraft’s place in the history of play? We look forward to hearing your thoughts! The relationship between toys, learning and play is a rich area to explore around minecraft. A few first thoughts on some related things you might look at. Thanks for pointing us to so many great sources, Trevor! We were thinking of Montessori, Friedrich Froebel (the inventor of Kindergarten), and also plan on referencing the BGC’s own Amy Ogata’s, “Designing the Creative Child.” MoMA’s Century of the Child exhibition catalogue is also calling our names…really looking forward to diving into the research on this! One thing that I’m rather curious about is the distinction between competitive and cooperative play. I’ve seen both variations in various minecraft mods. For me, that plays into the larger view of how I do and do not enjoy multiplayer experiences. Some of my fondest memories are from creating lego models with my friends as a kid, and even today I much prefer Mass Effect’s multi to Call of Duty or the like. David, should our proposal be accepted, we should definitely include mention of competitive play in Minecraft modifications. Do you have a specific example that you could point us to?